Gingin is one of the oldest towns in Western Australia and retains some important remnants of its pioneering days dating back to the 1850’s. However, The Shire of Gingin sports complex is a modern facility at the heart of community life. 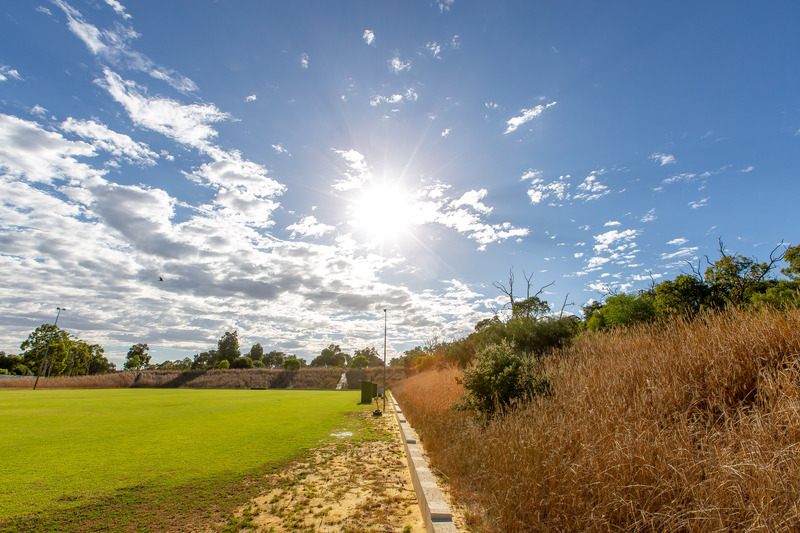 This facility includes the Gingin Aquatic Centre, a regional outdoor hardcourt facility as well as football and hockey fields with a clubhouse which is home to the Gingin Eagles hockey team. The unprotected slopes adjacent to the hockey field started to show signs of significant erosion in early 2018. 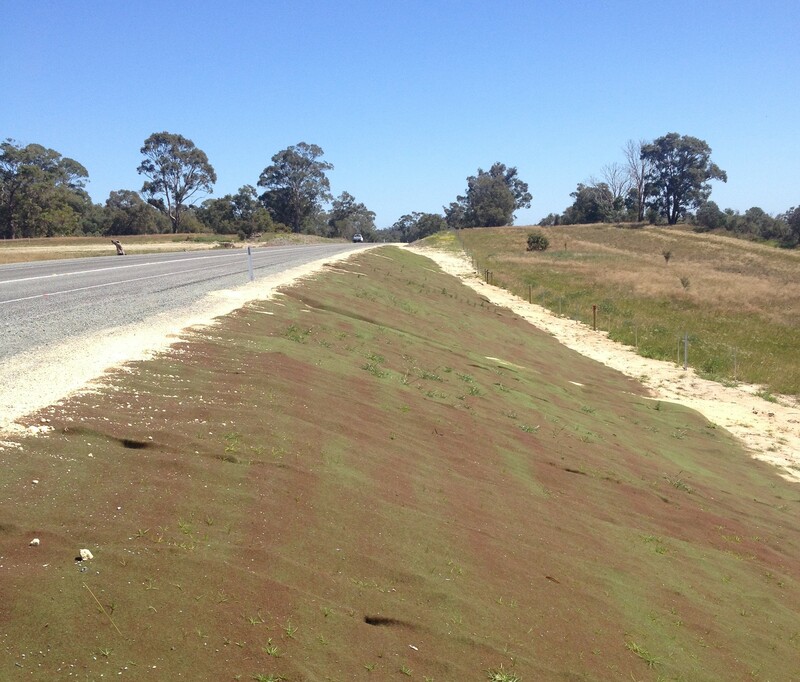 The Shire of Gingin contacted Geofabrics seeking advice on how to stabilise the eroding slopes. rill erosion from surface runoff was prevalent on the slopes surrounding the hockey field. Rill erosion is the removal of soil by concentrated water running through streamlets, or headcuts. Rills begin to form when the shear stress generated by the surface runoff is greater than the shear strength of the soil. This results in the surface runoff washing soil particles down the slope. 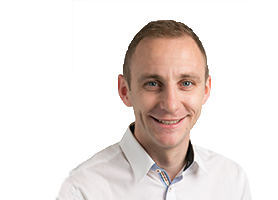 The onsite discussion established that a permanent solution was preferred so that vegetation would not be solely relied upon to protect the slope in the future. 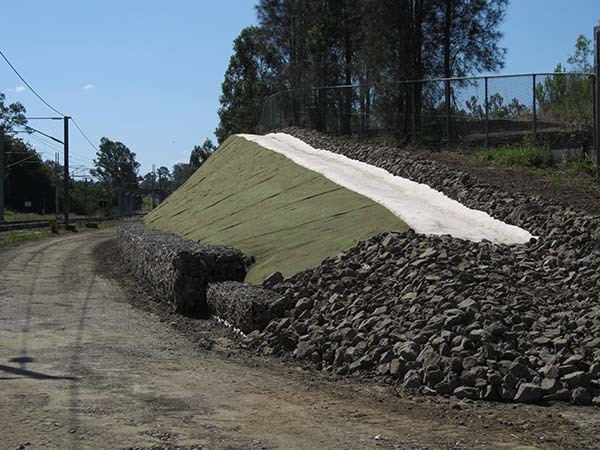 An alternative solution was a biodegradable erosion control mat, however this was not seen as a long term solution to the problem. Grassroots® turf reinforcement matting was the solution of choice as it offered an economic, engineered and permanent solution that achieved the desired aesthetics and performance. Ground Stabilisation Systems Pty Ltd were contracted by The Shire of Gingin to carry out the installation of approximately 3,500 m2 of Grassroots. Installation involved re-profiling the slope face to ensure that there was a smooth surface which was free from protrusions and vegetation. This preparation of the slope surface is important to ensure intimate contact between the soil and the Grassroots. The Grassroots was installed in an anchor trench at the top of the slopes and pinned at a rate of 3 pins/m2 down the slope using 300 mm long mild steel U-pins. The installation was completed within two weeks. The Shire of Gingin and the local sports clubs are very satisfied with the outcome of the project.